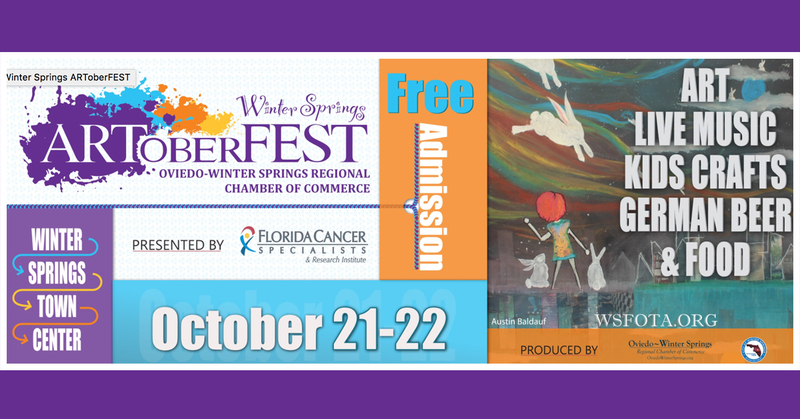 Home » Blog » Shows & Events » Winter Springs Artoberfest! Over 100 artists and a variety of vendors will be displaying their goods and artwork throughout Blumberg Boulevard at the Winter Springs Town Center from 10am to 5pm on both days. There will be live entertainment, featuring German music that will make you want to dance the afternoon away. The successful German theme will be continued at this year’s festival, which will be reflected through various food vendors serving German cuisine, including schnitzel, bratwursts and Reuben sandwiches. Top it off with a great variety of German beer and you have the art festival you won’t want to miss. A family friendly event, the children’s area will include a face painter, puppet show and other arts and crafts activities. Admission to the festival is free for all ages.